OAKLAND, CA. – Smaller farmers, mom-and-pop businesses and existing medical marijuana companies will have a place in California’s recreational cannabis industry if voters pass a legalization measure this fall. That’s the message California Lt. Gov. Gavin Newsom, a big supporter of the legalization measure, gave marijuana business professionals on Tuesday. Speaking to roughly 1,000 attendees gathered at a conference here hosted by the National Cannabis Industry Association, Newsom clearly tried to allay fears within California’s cannabis sector, and beyond, that a small number of corporate interests will dominate the state’s market. “We have got to protect the small cultivators” as well as entrepreneurs who don’t have access to millions of dollars, said Newsom, featured in the photo. To that end, the Adult Use of Marijuana Act – as the California initiative is called – includes language meant to protect the industry “against monopolistic practices” for five years, noted Newsom, the highest-ranking state politician to support the legalization measure. For example, any adult-use cultivation business that operates an outdoor facility larger than one acre or an indoor building that exceeds 22,000 square feet would be prohibited from getting a license until January 2023. All legal rec growers prior to that date would have to fall within those limits. Under the proposed law, state licensing authorities also would be required to consider whether issuing a particular applicant a permit might stifle competition or create a monopoly. Newsom stressed the need to ensure minorities have a place in the cannabis industry, and he also said existing medical marijuana businesses that have proven they can operate responsibly will have a leg up in obtaining a recreational license. “For those who have been good actors in the state of California, you’re going to be prioritized,” he said. Newsom’s assurances come as both supporters and critics of legalization around the nation have voiced concerns about the possible emergence of “Big Marijuana” that puts profit first, much like Big Tobacco. But not everyone shares that view. A new study from the Brookings Institution contends those fears are overblown, and that policy makers should instead focus on harmful practices – such as marketing to minors. Last month, supporters of the California ballot measure handed in more than 600,000 to the state, indicating the initiative is likely to go before voters in November. The initiative needs 365,880 valid signatures to qualify for the ballot, and all counties in the state must complete a random sampling of the petitions by June 30. After that, the secretary of state will determine whether or not the campaign has formally made the ballot. While California seems ripe for legalization, Newsom cautioned businesses about the dangers of overestimating the chances of success. Potential headwinds on the horizon could sink the entire effort, he warned. Polling shows that support for recreational legalization is lower in California than the country as a whole, though the latest numbers show some improvement, Newsom said. A May survey by the Public Policy Institute of California found support for rec legalization at 60%, while a March study by the AP-NORC Center for Public Affairs Research found that 61% of Americans think marijuana should be legal. Opponents, however, also are ramping up efforts to fight the California rec proposal, and some big money from outside the state could come flooding in to help sink the measure, Newsom warned. “The last few weeks we actually had some good polling, the strongest we’ve seen. But in the last few weeks the opposition has begun to emerge,” Newsom said, adding that rumors are swirling that a big funder will step in to defeat the initiative. If that happens, it could set back marijuana legalization in California – and the entire country – by years. The legalization campaign also needs more financial support, Newsom argued. The measure has the financial backing of billionaire businessman Sean Parker. But Newsom said a common misconception is that Parker can bankroll the entire campaign by himself, which has made many supporters complacent. “Sean’s got a lot of money, there’s no doubt about that. But he’s got a budget too, and he’s not going to fund the whole thing. There’s a lot of mythology about that,” Newsom said. Newsom said backers of the measure listened to the concerns of people around the state, including mothers who expressed fears of how legalization would have an impact on children. Others fear it will lead to a spike in intoxicated drivers or have a broader impact on society. 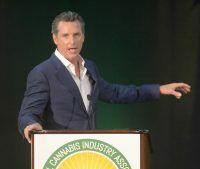 Newsom urged the industry to take these concerns seriously, adding that the legalization measure is structured in a way that it can incorporate changes going forward. I Hope Floridians are ‘Wise Enough’, to ‘put in’, some ‘Form’ of ‘Anti-Monopoly’, from the Start, as GOP’ers, which Favor ‘Big Corporations’. And, ‘The Brookings Institute’, wouldn’t ‘favor’ Big Corporations, now would it? And GFarma Labs is building the largest cultivation site in the country in Desert Hot Springs? Um what re; canopy or space limitation? Well big money is why we have corruption and no one outside of the state in any state should Not be allowed to make any influence on any outcome when they are not a citizen of that state! We must stop prohibition altogether because it is an outdated and ignorant unjust action on citizens! “protect the industry “against monopolistic practices” for five years,” simply means the little guy has five years to become big or he/she will be wiped out. Support for Legalization and Support for the AUMA in California are NOT the same thing… Most people seem to support Legalization, But not the AUMA. 90% of the round table discussions they had were in Northern California, hundreds of miles away from most of the states population here in So Cal. Seems like the few events that were in So Cal were either by invite only, or the date and time for the event went out at the last minute, and many people were unable to attend, due to the short notice. For those of you that don’t know until recently there were MANY different options for Legalization in California, One example would be MCLR, There Initiative spent more than a year as an open source document on the internet, ANYONE with internet access could go and add their ideas for creating a great initiative for California, and thousands of people did ! They had, in my opinion the most well written and comprehensive initiative out there, and it was all due to the fact that EVERYBODY really got to participate in their own way, everybody Really got to input their 2 cents, their initiative wasn’t written in a back room, by a bunch attorneys and corporations looking to increase the profit margin, It was written by Caring and concerned citizens of the state of California, the way and initiative should be ! That’s BS, Gavin. Local communities in most of the state are bending over backwards to keep even “legal” marijuana as restricted as possible…bans on storefronts, growers, etc. People who live outside of the traditionally pot friendly areas are going to find themselves shut out, by NIMBYism, under the AUMA. Also, the regulations about sending the product through distributors and testing are ridiculous. The AUMA isn’t about legalization, for legalization’s sake…it’s a money-grab, by politicians & rich people who see an easy way to get even richer. Sean Parker made his entire career by selling out the rights of other people, right out from under them, first with Napster, then again with Facebook. Wise up…the AUMA is a bad proposal. You have better rights and consumer protections, under the current medical use paradigm, in California. The AUMA is only a bad proposal if you’re actually worried about commercialization, which people seem to dislike simply because it’s commercialization and that’s a dirty idea. More importantly, if the DEA reschedules to Schedule II…you’re probably going to need commercialization to keep your industry afloat unless the feds decide they still don’t care about enforcing anything.